An international move requires weeks of preparation. From getting your documents together, finding ways to adapt to a new culture and actually shipping all of your belongings, we have the resources and experience to help make your move as smooth as possible. 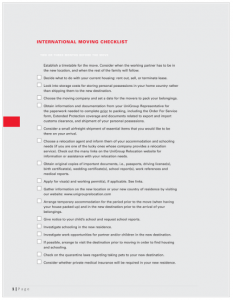 This international moving checklist will help you stay organized. Check it out!